Sketch Fridays #23 – Lead By Example. Click to Enlarge. Perhaps it’s because I’m boring or secluded or one that always tries to please, but when it comes to nerdy fiction I’ve always been drawn to the leader characters. Cyclops from the X-Men. Leonardo from the Ninja Turtles. Cecil from Final Fantasy IV. The Fighter from Final Fantasy. While many people write off these characters as bland, uninteresting, sophomoric, or––worst yet––assholes, I often found a sense of contemplative calm instead. I’ll be honest, I liked Leonardo best because he had swords––the most visibly dangerous of the weapons the Brothers Turtle had available. I am also a big fan of the color blue, which also worked in his favor. But my predilection toward him really came home in the 1990 film, Teenage Mutant Ninja Turtles, a mighty fine cinematic (the best, I dare say) treatment of the venerated yet mercurial franchise. When his brother is nearly mortally wounded, Leonardo stops all retentive nit-picking to focus on monitoring and caring for the ill Raphael (who does so comatose in a rural bathtub). Leo sits in a chair, day and night, waiting for any response, and is the first person there when Raph awakens. Furthermore, Leonardo acts as the bridge between practical realism and the old world spirituality in which the brothers’ shared ninjitsu rests. 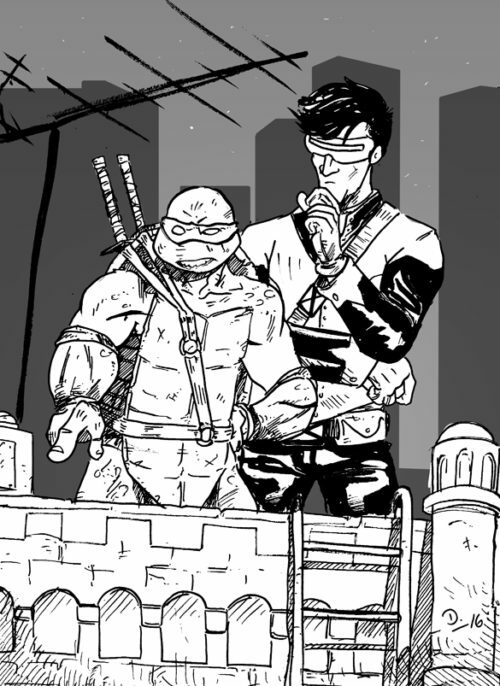 When the brothers are recovering and training in response to the kidnapping of their father (the wise old rat, Splinter), it is Leonardo that establishes an astral connection with his own adopted father through practiced meditation. Instead of trying to whittle answers from his father––to receive some personalized sage advice as his father surely counts down the moments to his horrendous and violent fate––Leonardo retrieves his three brothers so they can share the responsibility. As an only child, my friends become my family, and those I call friends are those that are very close to me. If anything, Leonardo’s behavior––again, mostly in the 1990 film––gave me a template for brotherhood that I could lay over any consequent life I lead. Despite being a nearly-naked turtle, from Leonardo I absorbed the idealistic values that constitute a huge part of who I am today. Glory is dust in the light. Leadership is a light in the darkness: alone, focused, and guiding. In contrast, I resisted the X-Men’s Cyclops (aka Scott Summers) for years, perhaps decades. As stated before, I am a fan of Wolverine. I connected with the latter if only because of my own fiery temper but also in my one-quarter Canadian blood. But I always respected Cyclops greatly (from the stories to which I was exposed, which was not an exhaustive retrospective). I respected the inherent tragedy of the character. As a boy, he suffered a head-trauma that left him not only a kid with the mutant power to shoot force beams out of his eyes, but also with brain damage that disengaged his ability to control said blasts. The only thing that was found to keep the eye-beams at bay (aside from Scott Summers’ own closed eyelids) were lenses made from ruby quartz. So, until the day he dies, he can only see the world through ruby (i.e., rose) colored glasses. Everything will forever be tinted crimson and, even though he has been afforded the ability to see (otherwise, he’d have to wander through life with his eyes shut), he has to accept that he will not be able to gaze upon the things which or those whom he loves without a filter between them, lest he mortally wounds them due to his uncontrollable gift. In response, Scott has become the quintessential X-Man––a boy scout, a flag-waving poster child for Xavier’s School for the Gifted––which, in his consequential blandness and devotion leaves him as either antagonist or plain background to the more colorful characters that populate the mansion. He overcorrects, for sure, but he does son in response to the life-debilitating deficit of which only he knows the fullest extent. But he demands no attention nor validation; instead, he only asks for respect when the klaxon sounds and the X-Men are needed to solve a problem. Otherwise, as you were. Part of me wonders if my reconnection with these characters recently is a response to me becoming a teacher––a person who must (in a very focused way) lead groups of people. In that sense, I do find myself idealistically devoted to the principles of the class I am teaching, like Leonardo balancing his practical leadership with his ancient mystical lore. I also find myself sympathizing with Cyclops, himself a teacher, and wondering how to balance the genuine interest I have in every single student with the job I must accomplish. As much as I want to be a friend, I must first––and foremost––be an example. So, I wondered what would happen if I facilitated a crossover––what if the boring, boy scout hero from one franchise met up with the equivalent from another? I bandied about with possible action drawings of Cyclops letting loose his optic blasts as Leonardo leaps into the fray with both swords drawn. But that felt easy and nondescript. What would really happen if these two stoics met up? What would actually occur? I figured they would plan. They would be planning the night before. So, I gave them a rooftop and let them talk, and I’m sure I may be one of the few that is quite interested in what they’re saying to each other.